One of the hits at the recent Esxence in Milan was the fragrances of Angela Ciampagna. Alfarom speaks to the founder. Angela Ciampagna has a quite striking aesthetic as a brand. A fascinating mix of post-gothic imaginary, a rustic / artisanal design which is quintessentially Italian and a strong mediterranean vibe. Can you explain your concept as an artisanal line of fragrances? The artisanal mindset is something we have to deal with everyday. We work in the fire-line… I mean that Enrico Maraffino and I concretely and straightly work with the raw materials, everyday. Our perfumes are the result of the combination of my creative effort, I work with the formulas, and Enrico’s technical effort in developing the laboratory procedures. 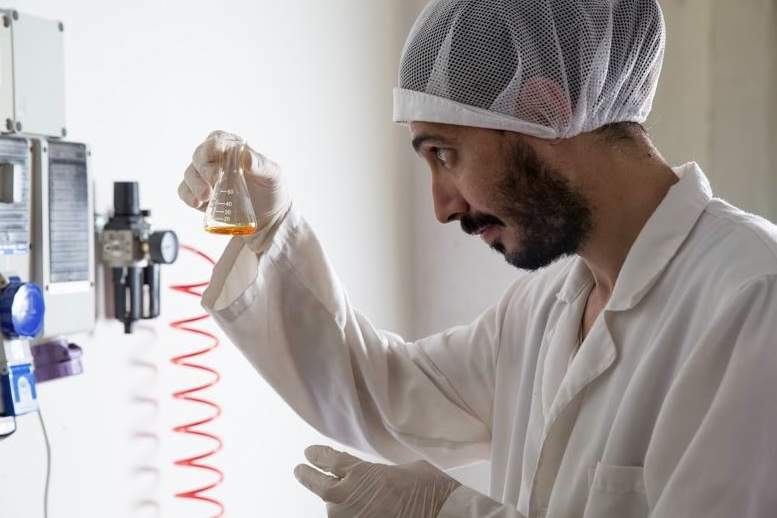 We study the formulas, we choose the suppliers of the raw materials, we build the tinctures, we follow the ageing out, the mixture, filtration, packing, etc. Everything has a unique handmade feeling, but using innovative processes, prepared ad hoc to have “faded” fragrances. For this reason we have made our debut conveying an appearance with no misunderstandings. Not a glowing perfumery, full of redundant luxuries. Our style of perfumery is the result of a genuine passion, research, tests, work and the will to constantly improve ourselves. We live in Atri, a small town in Central Italy, and we have chosen the rose window of the cathedral of Atri as the symbol and signature of our perfume house, because, in Italy, everything happens in the shade of the rose window, or the campanile. And the genuine craftsmanship is often hidden in the web of pathways, typical of every ancient Italian village, just like a treasure covered with dust, waiting to be unveiled. In our fragrances, you can find that treasure, concealed by dusty bricks, mouldy woods, smoke and fog, and the majestic but quiet nature. The excellence of every batch is guaranteed by our small-scale manufacturing process, so you can have your own numbered perfume,with its serial number exhibited on the bottle and box, because each and every single perfume is a unique piece. How did you get involved with fragrances? 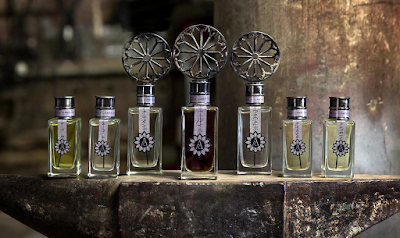 The history of our perfumes is the history of our workshop, Label Laboratorio Artigianale di Profumeria. 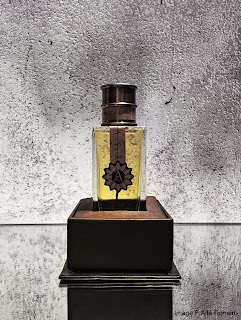 When we decided to professionally devote our life to the perfumery we started from ground zero… Before opening a production workshop, in 2011, we had taken the first steps making perfumes for third parties or creating custom-made perfumes for clients that were simply niche perfumery lovers. Every and each project was very important to improve our skills. For example, we have created long lasting perfumes for clothes, committed by some leading international fashion brands together with olfactive set-ups, scented candles, etc. That’s school! Practice is a very good teacher. Your line is run by Angela and Enrico. Are you both perfumers or do you cover different roles? Enrico and I are “partners in crime”. We are husband and wife, we’ve been living together since we were both 23 and now we’re 37. “Fortunately”, we spend a lot of time in the workshop with the mask on our mouths, so we don’t have many chances to argue… seriously, our roles are rather different and precise, even if we could intervene in the tasks of the other. I create the compositions, he follows the laboratory techniques and then the production processes. We work together during the ageing and maceration steps, when we have to check the performance of the fragrance. If everything is ok, we can finally say “we’ve got it!”. Anyway, I often ask for Enrico’s opinion during the study of the essays: if he embraces a certain facial expression, it just means “throw that stuff away”. If he says nothing, that usually means he approves. overly unpolished as many artisanal perfumes often do. 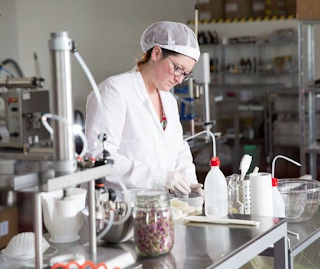 What’s your training when it comes to perfumery? No industry schools. I was lucky to have the occasion to develop my own production techniques with an important Italian industrial chemist, that has in part designed our manufacturing processes. But, beyond the procedures, I think that it’s equally essential to know carefully the raw materials, their “behaviour”, alone or mixed with other materials. That requires dedicated practice and research. I have paid special attention to the smells since I was very young, collecting and memorizing many smells and scents, so I have spontaneously enhanced this feature of mine. I remember that when I was just eight I paid my aunt a visit in a small village of the Veneto region. It was fall. The landlady of the flat, that we had taken for rent, guided us to the upper floor. Well, for the first time I had a kind of “Stendhal syndrome”, when I met the smell of the bedroom where I had to sleep: mothball, dry flowers, dust, clean sheets and a woman with her violet perfume that opened the riverside window. Oh my God! It was neither good nor bad. It was lively… It’s my pleasure to create perfumes that are able to tell a story, just like the scents in that bedroom. Perfumes shouldn’t be good or bad, they should be a fist to the breastbone. You could say that I learnt this job in an odd way, and it’s quite true, because I wasn’t in a school or in a corporation, that’s why you can find a “dirty” track in my own way to create a perfume formula. I don’t want to loose that track. Enrico is the chemical side of the workshop and he’s an excellent working partner. We have a similar approach and even in the production steps we look for innovative solutions to accentuate the “imperfect” tone of every composition. The brand is not only the outcome of my creativity, but also of our laboratory experience. For both of us, “imperfection” is something the always has a story to tell, something that wants to show exactly what it is. And our products want to show our genuine artisanal excellence. How do you source your ingredients? Do you create your own extraits and absolutes or you just buy them from bigger suppliers? We follow the extraction of several raw materials, but many more are produced in different locations: Vietnam, Africa, India, etc., even Europe, of course. Acquiring premium raw materials is not so easy, it requires a great competence and too much money… this is one of the reasons why we have decided to work even on olfactive projects for third parties designed for the selective market. For how long have you been working on your former range and how did you assembled it? When we started to work in Label we had just one purpose in mind: to launch our niche perfumery brand. Since then, together with the third-parties projects, we have worked to build what the Angela Ciampagna brand is now. And we have two more fragrances, we created during the last years, that we are going to introduce in the near future. Why too many years before launching our own brand? We struggled to get our deserved credibility. We had not partners, agents or big distributors that supported us. We are not well-born. Our everyday work supports our everyday work. Diligence is our sole ally. I find most of your fragrances to have an incredibly solid bone-structure which can only be achieved via objective skills but mot of them are also competently twisted to introduce an element of ‘disturb’. What does this element mean in your way of creating perfumes? Life is made of imperfections: the train is late, you punctured a tyre, your pizza is burnt, that special date was a failure, your daddy is going to die… that’s life. When I deal with raw materials, first of all, I give them my respect, it doesn’t matter if they are natural or synthetic. Only after I listened to them in depth, I’m able to find the best way to let them speak and to let them tell people my story. Every composition is then scratched, blemished and covered with dust, so it’s made really lively, more true, just like all the imperfect things. Is there a common theme in your line? How living on the italian countryside influenced your way to conceive and create fragrances? Enrico and I move many times. At the moment, we live in Atri with our two daughters, Blu (8) and Era (3). A tiny village on the hills, located very few kilometers away from the Adriatic Sea, is the perfect place to raise your kids and company. Living there surely helps us to focus on easy things and to look at the sky. You should have enough humility and moderation to do this job, to do every job actually, so it’s better if the sky is at hand. What’s next at Angela Ciampagna? To have the favorable opinion of the fragrances lovers. To convey that there are hardworking people behind this brand, there are study and research, and we offer the outcome of all this work in some tens of ml. You can find out more about the company at their website here. This interview originally appeared on Basenotes.